The Darkened Sea is EverQuest's 21st Expansion! This expansion will not continue the "staggered content release" style we have seen for the past two expansions. Instead, all of the expansion content is available on day 1. There is reason to believe there will be more content released throughout the expansion cycle, but will likely not be officially tied to The Darkened Sea expansion. Players can now obtain level 105! 8 beautiful new zones, including an island filled with Dinosaurs, and a futuristic alien looking zone! The Darkened Sea has group flagging. 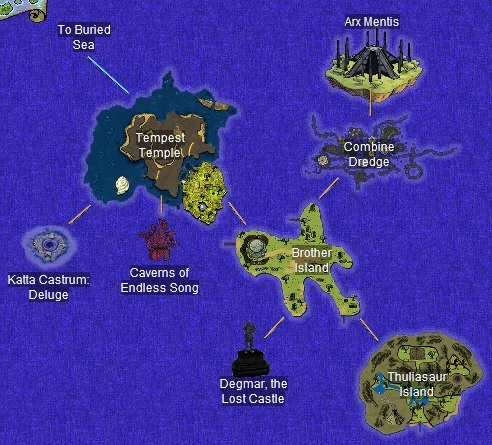 Only the two Tier 1 zones (Tempest Temple and Katta Castrum: Deluge) are open zones. To gain access to Tier 2 zones, you must complete the flagging chains in Tempest Temple and Katta Castrum: Deluge.